Corbett National Park situated in the foothills of the Himalayas, in the newly created state of Uttarakhand is haven for wildlife lovers in India. 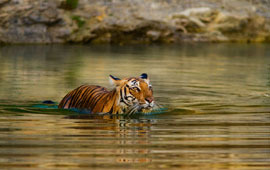 The present area of the Corbett national park is 1318.54 sq. km. including 520 sq. km. of core area of and 797.72 sq. km. of buffer area. The core area of the Corbett tiger reserve forms the Corbett National Park while the buffer contains reserve forests (496.54 sq.km.) as well as the Sonanadi Wildlife Sanctuary (301.18 sq.km.) Flat valleys are interspersed with hilly ridges and the Park's rolling grasslands provide an excellent view of its rich eco system. Corbett National Park is one of India's most beautiful wildlife areas has a tiger population of around 160, which makes this park as the last and the most important bastion of this endangered species in India. Corbett Park’s 1318.54 square kilometers of virgin forest and jungle are home to numerous other species of fauna. The rich biodiversity of the park is a perfect place for bird enthusiasts; the area is considered one of the best bird-watching areas in India, with some 600 species having been sighted in the park. The different habitat types of Corbett Park i.e. mountains, Sal forests, chaurs (grasslands), khair-sissoo forests, and rivers have their distinct assemblage of plants. More than 600 species of birds, trees, shrubs, herbs, bamboos, grasses, climbers and ferns have been identified in the Corbett Park. The most visible trees found in Corbett Park are Sal, Sissoo and Khair. Many other species that contribute to the diversity are found scattered throughout the Corbett park. Chir Pine is the only conifer of the Park and is found on ridge-tops. The upper reaches near Kanda ridge have Oak growing, which is essentially a Himalayan species. Other major tree species seen in and around Corbett park are Bel, Kusum, Mahua, Bakli.